Single location between the two municipalities Bremm and Eller (area Burg Cochem) in the German growing area Moselle, Excavations on the Calmontrücken prove that wine was already cultivated here by the Romans. On the mountain there was a Roman mountain sanctuary from the second century. From the year 2005 elaborate archaeological excavations were carried out; The Gallo-Roman temple was reconstructed and rebuilt. The Roman poet Venantius Fortunatus (530-610) described in a poem at a Moselle boat trip to 588 the Calmont. Maybe the poet too Ausonius (310-395) knew this vineyard. The name goes either to the Latin "calvus mons" (bald mountain, rock) or "calidus mons" (hot mountain), or to the Celtic "Kal" (hard = rock mountain) back. Around the ridge flows the Ellerbach, which flows southeast of the ridge in the Moselle. 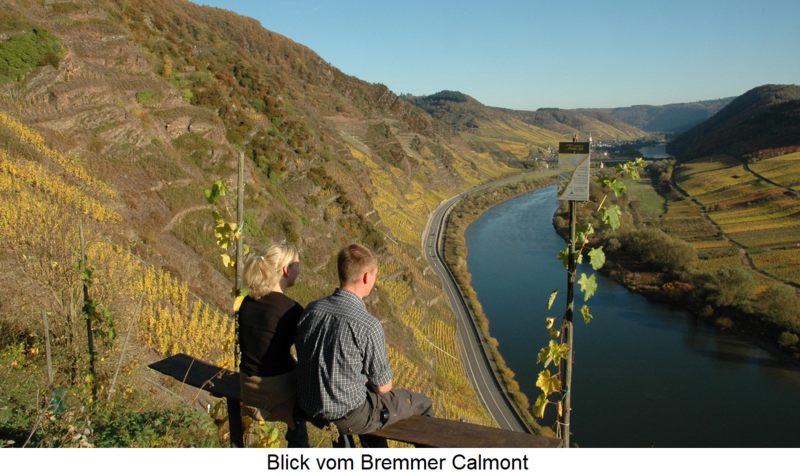 The 378.4-meter-high Calmont Peak is located just 290 meters above the Moselle. A mere kilometer southwest of the Calmont summit is 365 meters high, a viewing plateau. Here stands the built around 1970 "memorial of the war generation", a 12 meter high (summit) cross. The orientation from southwest to southeast counts with up to 68 ° Tilt (248%) to the steepest vineyards of the world. It covers 33 hectares of vineyards. The rows of vines have been tirelessly worked in natural stone walls over the centuries terraces created. The steepest area in the location is typically called "Bremer Todesangst". The winemakers need mountaineering skills for the work and must be free from giddiness. The management is going through Monorackbahnen (Single rail rack railways) supported or made possible at all. These serve as a means of transport for piles, fertilizers and grapes at the harvest or just as a climbing aid for the winemakers. 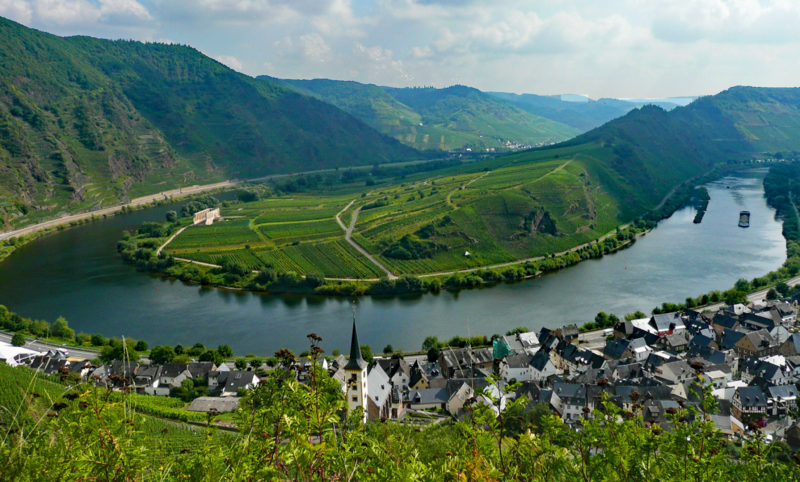 Mainly the Riesling is cultivated here. In 2001, the Calmont via ferrata was built with the energetic help of committed citizens. The narrow footpath with a length of about three kilometers was secured with six ladders, around 100 meters of safety ropes, 22 stepping stirrups and 16 treads and made accessible. It runs through an extraordinary landscape with a rare flora and fauna. Shares in the situation have for example the wineries Amlinger & son. Boendgen. Franzen Michael. Franzen Reinhold. Laurentiushof, Leitzgen Günter, Treis Johannes and Vinitorum Quaterni. This page was last modified at 31 March 2018 at 10:14.